Want your network traffic to flow fast, furious and unfettered? If so, check out these Quality of Service and bandwidth management tools. QoS Control for e-Business 2.6 incorporates IP Magic technology (Figure 2), Lightspeed’s proprietary object-oriented software architecture, to help you assess and manage network traffic flow. What a welcome change from the complex tpc.exe command line—QoS Control’s vibrant, drag-and-drop diagram-like interface lets you efficiently approach one QoS task at a time. Figure 2. Employing Lightspeed Systems’ IP Magic, your Napster woes soon will be forgotten. Your first task with QoS Control is to define a traffic flow; you do this by inserting IP Magic objects into the simple-to-use diagram interface. Numerous objects are available, including Destination NAT, Diffserv Marker, Interface and Speedometer. 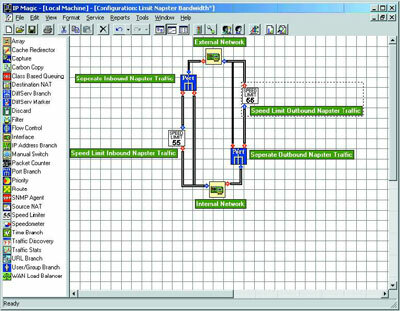 Using built-in tools, you fine-tune the diagram, manipulating network traffic configuration as needed. When you’re satisfied with your configuration, you activate it. To help you address different QoS issues, QoS Control offers a number of sample configurations. I decided to test drive the ever-popular Limit Napster Bandwidth scheme. With several clicks, I drilled down on this configuration and found the IP objects used to control Napster bandwidth usage. Taking advantage of two of these objects, Speed Limiter and Speedometer, I was able to quickly create configurations to limit Napster bandwidth and even discard packets. I also found that QoS Control takes security seriously, offering tight integration with Groups and Users so that IP Magic Server access can be controlled. You can easily determine what users can or can’t access the local domain controller. After putting QoS Control through its paces, it proved its worth as a robust application. In addition, it pleased me to see that online and hardcopy documentation are both thorough, with the hardcopy documentation providing a detailed explanation of each IP object. With QoS Control, you can easily make a Win2K machine a bandwidth management device.